Plagued by breathing problems and unwanted changes in her appearance, Diane Kolmer turned to Mayo Clinic for diagnosis and treatment that included reconstructive surgery. Now she's back to looking and feeling like herself again. 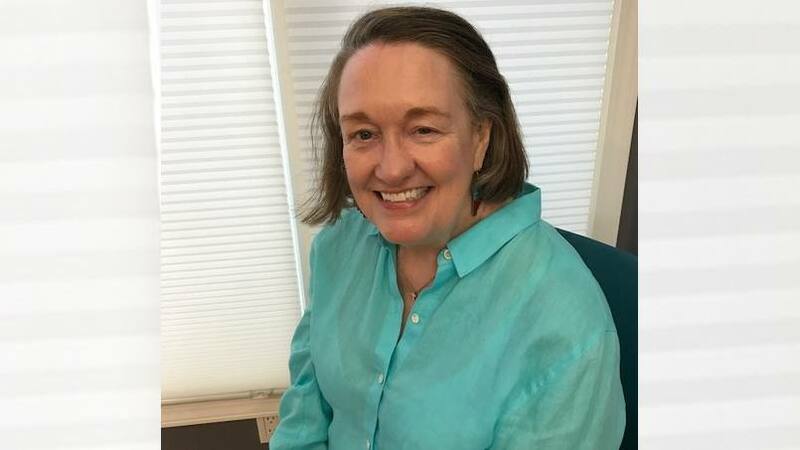 Twenty-one years ago, when Diane Kolmer began her battle with multiple sclerosis (MS), she came to Mayo Clinic looking for answers about the progression of her disease. She worried about how it might limit her ability to continue her work as a lobbyist and do the other things she enjoyed. In 2014, she returned to Mayo Clinic's Rochester campus for another significant concern. Her left nostril became deformed, and she was having a hard time breathing. That visit eventually led to surgery to relieve her symptoms and reconstruct her nose with the hope of feeling and looking like her old self again. "Of all the things I had done at Mayo, this was the most life-changing," Diane says. "I've had so many physical and emotional losses from MS. This was one thing that was reversible, and that meant a lot." When Diane noticed she was having trouble breathing through her nose, she went to a number of physicians in her hometown to find the source of the problem, with no luck. "It felt like I had a football in my nose," she says. "I had seen every type of doctor in Des Moines, Iowa, to try to figure it out. But after four years, I finally called Mayo Clinic to see if someone there could provide a diagnosis." After meeting with physicians in Mayo's Department of Otorhinolaryngology, Diane was diagnosed with trigeminal trophic syndrome. 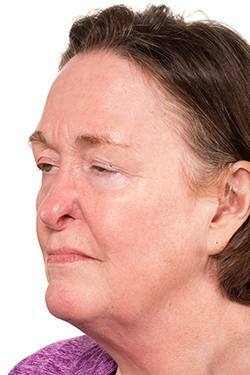 A rare disease, it can cause breakdown in facial tissue as a result of damage of the face's trigeminal nerve. Her care team told Diane that the disorder may have developed as a side effect from stereotactic radiosurgery, a procedure Diane had years earlier to get rid of excruciating face pain. Initially, Diane's doctors decided to keep a close eye on her condition during follow-up visits every six months. Unfortunately, discomfort turned into deformity. "I started having an indentation on the side of my nose and tissue had been forming underneath it," she says. "It looked like I didn't have a left nostril." Diane Kolmer shown before surgery. Diane's condition led to other issues, as well. She was hospitalized four times in 2016 for pneumonia. She had a constant headache and looked like she had a sneer on her face all the time. In December of that year, Diane was referred to Grant Hamilton III, M.D., a Mayo Clinic facial plastic and reconstructive surgeon. Dr. Hamilton explained to Diane that she had a hole in her nasal septum — the thin wall between the nasal passages — and the condition had caused the lining in her left nostril to shrink. "As that lining contracted, it distorted the outside of her nose and narrowed her nasal passage," Dr. Hamilton says. To correct this, Dr. Hamilton told Diane he could bring down the nostril and rebuild her nose using cartilage and skin from her rib and one of her ears. He also understood that the problem was affecting more than Diane's physical appearance. "Our faces are almost entirely what give us our sense of identity, and when something significantly changes that, it can profoundly change how we see ourselves,” he says. "Dr. Hamilton was very curious and meticulous," Diane says. "I could tell this was something he's really cared about, and he was very invested in helping me." Diane decided to move forward with the surgery, which was scheduled for March 9, 2017. During the procedure, Dr. Hamilton reconstructed the cartilage support structures in her nose. "One of the things that was very unique about Mrs. Kolmer was that she was missing so much tissue," he says. "After recreating the structure of her nose, there was a large skin defect on the inside, so I took cartilage and skin from her ears to fill that part in." Once the swelling went down after a few weeks, Diane could feel the difference. "I lay on my pillow thinking, 'I can breathe. This is amazing,'" Diane says. "And I don't have any more headaches." The positive changes the surgery has made for Diane reflect the goals Dr. Hamilton has in the work he does. "Much of what we do in medicine is about quality of life," he says. "One of the most rewarding aspects of what I do, and one of the primary reasons I chose this field, is to see the almost immediate improvement in people's quality of life and demeanor. I wasn't treating her nose. I was treating her." Learn more about facial plastic and reconstructive surgery. Read about Mayo Clinic's Department of Otorhinolaryngology. Explore Mayo Clinic's Rochester campus. A life-changing surgery on so many levels! Mayo is so fortunate to have such a caring, dedicated surgeon.